Anyone notice the "internal dropper guide tube" inside the seat tube of the calling? I have a problem inserting the dropper post beyond the half way mark down the seat tube due to the obstruction of the "inter dropper guide tube". Anyone having this problem having to use a shorter drop up seat pole? There should be plenty of room in your sea tube for a normal dropper. What size are you on and what size dropper? There shouldn't be anything in the way of a typical set up. I m on Fox transfer 125mm 30.9 seat diameter. 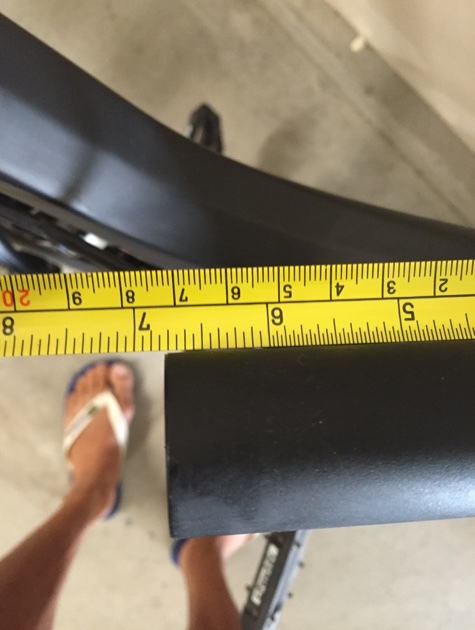 The length of the seat pole insertion is 248.5mm. I can only insert the seat pole to about half way before I experience an obstruction. The obstruction is the internal dropper guide. So I measured my large frame by sticking a metal tape measure until it wouldn't go anymore and I measure 12 inches or 308 mm (if my math is correct). It should fit. I just built up a 2016 large following with the same 125 mm travel 30.9 mm diameter fox transfer seat post, and it will insert all the way (i.e. I run out of seat post before I run out of insertion). Maybe for a small size frame you wouldn't be able to do this, but it sounds like if you can only insert it halfway that there is something wrong. Have you already routed the cable housing for the remote through the tube? If so, perhaps the housing itself is getting caught on something and not allowing the seat port to insert all the way. To clarify further, after attaching the head of the cable to the seat post as instructed in the Fox manual, you must pull the cable housing back through the port towards the lever as you insert the seat post. If you don't do this, the housing just bunches up in the seat tube and keeps it from inserting all the way. The housing won't just slide by through by itself as you insert the seat post as it is fairly tight in the internal tube. You may find you need to trim more of the housing off than you think. I found that to install the lever with the proper amount of housing, you need to remove it from the bar (if you already mounted it there), because you cannot pull enough housing through the port with it attached to the bar and still to be able to attach it to the seat post otherwise. Then after attaching the cable end to the bottom of the post, pull the housing back through as you insert the post, then re-attach the lever to your bars. On my small Insurgent, the max insertion length before I run into an obstruction (the bend in the seat tube typically or the dropper remote hardware at the bottom of the post hitting the bend) is a little less than 170mm (give or take). This is why I can't run a 150mm dropper on a small frame. fyi - the max insertion length on my size medium evil calling is 210mm. The post doesn't stop at a bend in the frame, it stops when it hits the internal cable routing tube. I could only fit a 125mm fox transfer dropper in it (and I can't push it all the way down), I would have preferred to use a 150 dropper but it works. I'm looking to buy a Fox Transfer dropper, it seems Fanatik fitted a 150mm in their Medium The Calling build. I'm riding a Medium frame with 32'' inner seam. Currently have 200mm exposed seat pillar on my none dropper. I have no problems fitting a 150mm Transfer on my medium Calling, purchased November 2017. My pant inseam is also 32"
I'm undecided between the Transfer and The Bike Yoke Revive. You got a pic with post sully extended please ? Retrofitting internal dropper post cable -possible?